What a great, fast read. This was my first real zombie book, though I don’t know if I would actually call them zombies, they just share similar characteristics, and I loved it. The story immediately takes off, which was a pleasant surprise. I didn’t expect the ‘attack’ to come so soon, but it really helped to keep me entranced with the story. The main character, Kennedy, was well written. I thought it was a bit convenient that her father trained her as a soldier while growing up, he was a Marine, so she was capable of doing so much to help her survive, but I also appreciated that there was an explanation for it, even if it was a bit far fetched. Sometimes it’s worth opening up your mind to something unrealistic, especially when you’re dealing with flesh eating humans. There was more romance than I expected, which may be a deterrent to some readers, but I personally liked it. There’s not necessarily a lot of mushy, gushy stuff, but there is a few chapters where Kennedy and Harrison spend a lot of time talking, which can make the story slow down if you’re not interested in their relationship. But it also helps create a bit of mystery around Harrison and makes you want to keep reading to figure out what exactly is going on with him. All of their plans seemed well thought out by the author, especially a few things that Harrison comes up with. Never once did I think, “Seriously?” It was believable to me, right up to the end. I’m a fan of Falter’s writing style. She seems to know what details to focus on and what are unnecessary for the progression of the story. I’m definitely interested in reading some of her previous work. When I first read the end of the book I was a bit upset, but it was because I hadn’t realized it is the first book in a series. I would have freaked out if that was really how it had ended, but now I’m just eager to get my hands on the next book in the series. 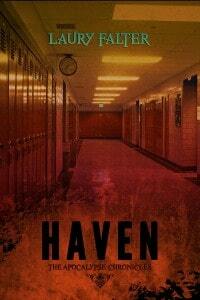 Check out what the other book reviewer’s had to say about Haven. It looks like a wonderful series. Sounds like the author created a great balance between action and romance in this book. I’m glad you enjoyed your first zombie adventure! This is already on my to-read bookshelf! Can’t wait to get started!